When it comes to one ingredient that I consume more than anything else in the world, it has to be shrimp. I love shrimp and I can eat it every day and for every meal. I am addicted to it. When I had caramel shrimp at Cat Restaurant in Little Saigon a few weeks ago, I fell head over heals in love with it. It was one of the most delicious shrimp dishes ever and the taste was rich and intense—sweet, salty, savory, and extremely umami. I came home and did some research on my cookbooks and the internet for the recipe but I was undecided. And then David of Houston Wok came to my rescue and shared his Vietnamese caramel shrimp or tom rim recipe with me. I made it for my good friend Show Shanti (check out her beautiful blog and awesome photography about learning authentic Chinese cooking from real Chinese families in China, a MUST-READ) and we all thoroughly enjoyed it. 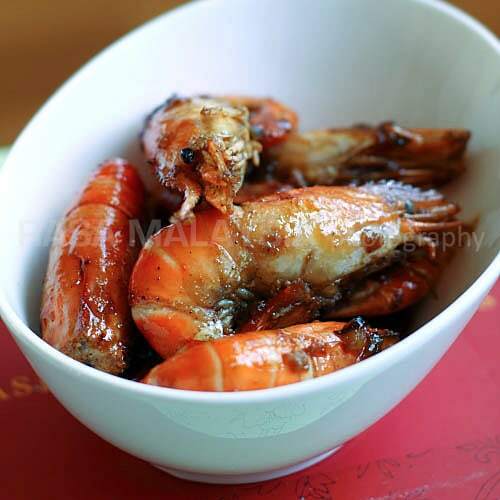 Caramel Shrimp (Vietnamese Tom Rim) - one of the most delicious shrimp dishes ever and the taste is rich and intense—sweet, salty, savory, and extremely umami. Add all of the above ingredients in a mixing bowl and allow to marinate. To make the caramel sauce, put sugar in a small pan, spread to an even layer. Cook at medium heat (without stirring) until the sugar starts melting. Now, you can start stirring the sugar and keep cooking until this turns into a dark amber color. Turn off heat. Note that the sugar will continue to turn a darker color. Wait for about 30 seconds to one minute before adding the 2 tablespoons of water. Be careful as this will splatter. Turn the heat back on and cook at low heat until the caramel dissolves. Put the shells in a small pan and add a few tablespoons of water. Boil for a few minutes at high heat then discard the shells. Continue boiling to reduce the stock to about one tablespoon. Heat oil in a wok at high heat. Add shallot and garlic; sauté until fragrant. Add the shrimp and brown quickly. Add the stock, fish sauce, caramel sauce, salt, and sugar. Cook until the shrimp is done and the sauce thickens, about 4 to 5 minutes. Add the scallions, stir, and turn off heat. Sprinkle on some black pepper and serve with steamed rice. Your tom rim looks yummy! How I make this dish is slightly different than yours. I usually make the caramel and keep it in the fridge for whenever I need to use it, it’s there. I add a little salt, some sugar, some garlic, some mushroom powder instead of msg, and red chili pepper for some spiciness. All these ingredients can be used on chicken as well, for ga ru ti. How delightfully easy! Since I have allergies to shrimp, maybe I can use the caramel sauce for fish! Sounds yummy, but I agree, some chilies would be nice. So happy I could be a part of this scrumptious Shrimp adventure. My favorite part were the heads filled with fatty goodness that went so well like butter, with the sweet and black-peppery sauce. So easy! A must try at home! Mmmmm, I think Shanti’s comment about the heads made me even more hungry for these shrimp! YUM!! My bro & I go nuts for shrimps just like you do! Look yummy!! Can you use store caramel instead? looks yummy. I must try. Can I use honey to replace sugar? Sure, any cooking oil is fine. oh my…i’m in love. i could eat this every night of the week. This is my first day to enjoy your blog and finding madeleines and shrimp recipes made my day perfect. The photography is terrific and makes my mouth water for everything I see. I can’t wait to try these recipes. I have one request do you have a special “garlic Shrimp” recipe in a brown sauce. In most Asian restaurants I go to feature this dish and it’s my #1 choice from the menu. I would like to try making it at home. Guess what I’m making tonight?! Ooooh, show me the pictures, or post it up on the blog. what do you mean by soup spoon? Are you refering to the chinese soup spoon because I tried to make this dish and the sugar stayed separated from the oil. The sugar caramelized on it’s own and as soon as there was not heat, it hardened. What’s the sauce supposed to look like? exact same thing happened to my sugar oil sauce… forget about putting it in d fridge for future caramel sauce.. d sugar hardened like a rock with oil on top of it.. right? Made the 2nd recipe. Was never any good at making candy, so I was afraid of the caramel sauce preparation, but it was easy. As described, adding the water hardened up the sugar and crackled and popped, but eventually it dissolved into the water. I also wasn’t sure if it needed to stay warm as I prepared the rest of the recipe. It doesn’t. Just wondering – only 1 tsp of the caramel sauce goes in the recipe, after making the sauce with 2 tbsp sugar and 2 tbsp water? I only did the 1 tsp, and now feel like it could have used more.